I’m pretty sure I would have been burned at the stake for heresy. In fact, I’m pretty sure there are people today who consider me heretical. I also know many have already burned me at the stake in their minds. And I’m really OK with that. In fact, I’m of the opinion that if we’re not talking about stuff that makes people uncomfortable, maybe we’re not talking about the right stuff! But there’s a fine line between the stuff that makes people uncomfortable, like Truth, and stuff that makes people uncomfortable, like dogma. Truth makes us uncomfortable because it causes us to stop and think. It causes us to examine our preconceived ideas and take a look at something from another perspective. It’s purpose opens our thinking. It’s expansive and inclusive. Dogma, on the other hand, makes us comfortable because it gives us that oh-oh feeling. It wants conformity and makes judgments about those who won’t conform. It’s purpose is to tell us how to think and what to think about. It’s constricting and polarizing. Every once and awhile, I get one of those political-religious emails that causes me to start frothing. I usually just ignore them, deleting them before it ever opens. This one caught my attention because it had Rick Perry’s name in it. Rick Perry is the governor of Texas and, since I live in Texas and he’s also considering tossing his name into the presidential arena, I though I’d at least look at it. Bad idea. He used all sorts of religious phrases like, his call and prayer and fasting. He tied it to our nation’s budget crisis (interestingly, he failed to included the Republic of Texas and its budget crisis) and invited people to join him for his day of prayer and fasting at an arena in Houston August 6, 2011. In June he issued a proclamation for this event, citing historical U.S. references straight out of Wikipedia (the links will be at the bottom of this post for you to check out on your own…should you care to verify). This is a huge subject and deserves thoughtful discussion, but it’s one that will have to take place over many posts. For today, however, I’d like to offer this one thought: the wall of separation between church and state as designated in the First Amendment of the Bill of Rights, was an incredibly important and fore-thoughtful. Writing the Constitution was an arduous, contentious process and covered the organization of the government, the relationship between the federal government, states, and people. The fact that individual’s rights weren’t addressed in the Constitution was a significant problem for some. There was concern the Constitution wouldn’t be ratified if individual’s rights were added to the mix, so the framers kept it simple. After the Constitution was ratified, then James Madison with Thomas Jefferson’s input, wrote what we now know as the Bill of Rights. The purpose of the Bill of Rights was to keep the government from infringing on rights and liberties that were considered to already exist! The Bill of Rights doesn’t create rights and liberties, but limits the government from overstepping its bounds. Suffice it to say, the wall between church and state, the First Amendment, was very important to the framers given that many of their families had escaped religious persecution in the Old World. But lest we think that only the framers considered the separation between the two institutions, we can also look to Martin Luther of Protestant Reformation fame. His articulation on “two kingdoms” is the beginning of modern thinking on this separation concept. So the word of warning (or heresy)? 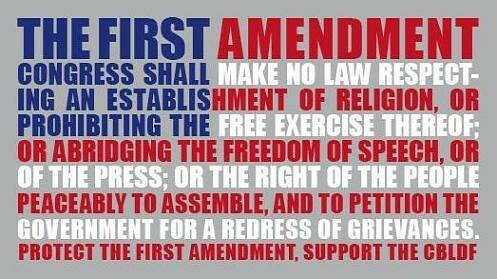 The First Amendment preserves our right and liberty to worship the God of our understanding…or not. Those in governing capacity must honor the wall of separation between church and state. What they choose to do in private is their right. We all must respect the rights of others…especially if different than our own. And I haven’t even gotten started on the real role and purpose of prayer and fasting! Rick Perry’s Proclamation for a Day of Prayer.